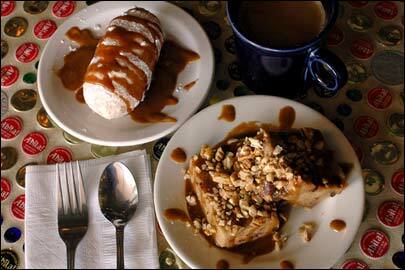 Praline pistolette and bread pudding are two dessert choices to round out a meal at Evangeline Cafe, above. 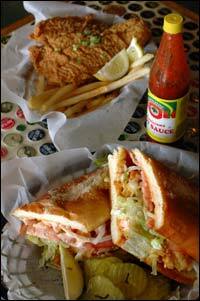 The shrimp po' boy and catfish dinner, top left, are two Louisiana-style seafood dishes. Top right, the oysters contraband and crawfish Evangeline are both delicious Cajun dishes. Evangeline Cafe. 8106 Brodie Lane, 282-2586. Rating: Forks up. Price: Cheap. Like the neighborhood bar on "Cheers," restaurants occasionally develop a congenial following in a relaxed setting where folks get to know each other by name. That has happened at Evangeline Cafe in Southwest Austin. On two recent visits there, I watched owner Curtis Clarke make the rounds, greeting many patrons by name and stopping to ask those he didn't know if they were enjoying their meals. Maybe it's the live music (Tuesday to Friday nights) that brings diners back. Maybe it's the laid-back attitude. 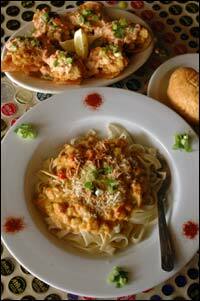 Most likely, though, it's Evangeline's Cajun and Creole fare. The oysters contraband ($7.95), six fried oysters on homemade potato chips topped with a spicy sausage r�moulade sauce, were among the tastiest oyster dishes I've had outside Louisiana, Clarke's home state. The boudin ($2.50), a zesty mix of pork and rice in a sausage casing, was as good as it gets. The crawfish Evangeline (8.99), which featured crawfish tails in cream sauce over fettuccine (a Cajun version of fettuccine Alfredo) was delicious. The only dish that didn't appeal to me was the sausage and chicken gumbo ($7.95 for a bowl). Although it had a traditional dark-roux base and good flavor, a thick layer of grease also floated on top. It was the only thing I'd pass on during a repeat visit. In comparison, the fried catfish ($8.95 for the dinner version with salad and fries) -- often a mediocre offering at many restaurants -- was perfect. Envision the best chicken fried steak you've had, with a thick, golden, rough-textured, non-oily crust covering non-greasy meat, and you'll know exactly what this catfish was like. For dessert, the pecan praline pistolette ($3) was a sweet version of the French roll the cafe serves, both plain with entr�es and stuffed as an appetizer. This one was filled with a pecan praline mixture, dusted with powdered sugar and drizzled with caramel sauce. It was a confection that was as unpretentious and carefree as the restaurant itself, one more example of why people return to Evangeline. Presented by The Austin American-Statesman. Contact us. Corrections. Site Requirements. Copyright 2001-2007 Cox Texas Newspapers, L.P. All rights reserved.